“A full 70 pages revealing information on how to interpret your Google Analytics data to help increase the conversion of your website. This workbook teaches you how to properly combine Google Analytics, Goals, Funnels, E-Commerce Tracking, and Google AdWords to drive more qualified traffic to your website and increase sales. Installation tips, shortcuts, screenshot illustrations, helpful hints, troubleshooting, conversion secrets, and more. This Workbook is also available in the non Zen Cart version suitable for any type of website. The principles revealed in this workbook can apply to ANYONE using Google Analytics, no matter what e-commerce system you use. 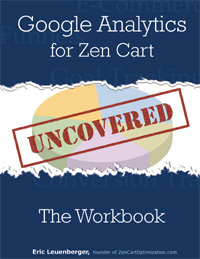 Over the past several months, I’ve had hundreds of requests (and even more questions) from users on proper configuration of Google Analytics integration with Zen Cart so that the reports you receive from it give you the best chance of increasing sales at your store. Installing Google Analytics is one thing, and can be fairly easy if using the newest version of Simple Google Analytics — which now includes conversion tracking. However, installing and properly configuring all components of analytics to work together is a whole separate (yet important) issue. In fact, just installing the Simple Google Analytics contribution alone will not enable all features available to you with Google Analytics. And you really need all components in place to have the best chance at increasing sales. Why? Because properly setting up and configuring Google Analytics to help you increase sales requires you to not only install tracking code on your website (which is the only thing the Simple Google Analytics contribution does), but also requires you to setup and configure certain elements available only from within your Google Analytics account. Then, once you have everything properly configured and in place, you need to be able to read the key elements in those reports that indicate what your visitors want, and act upon those to give you the best chance at increasing sales. If you are unable to find the key statistics within your analytic reports and properly interpret what they are telling you, then you have very little chance of increasing conversion (and therefore sales) of your website. This workbook was inspired by users just like you. I created the workbook on Google Analytics to address the many concerns that users have asked about proper and complete installation, as well as to address many critical elements that are too often overlooked. Oftentimes users think that “just installing Google Analytics” will give them the information they need and show them how to increase sales. This couldn’t be further from the truth. In fact, as mentioned above, just installing Google Analytics won’t do anything except give you a bunch of numbers that in the end mean nothing. You need to do more. You need to install and configure ALL components of Google Analytics, tie them together, and be able to pick out and interpret the key statistics that are then reported on. Only then will you have the information you need to make alterations that increase sales at your store. This workbook is setup to help you achieve exactly that. Help provide you with more information to increase sales at your website. By implementing just a few of the items detailed in this “how to” workbook, you should be well on your way to decreasing costs and increasing sales. What is Covered In the Workbook? I not only cover how to properly install Google Analytics and all it’s components (Standard Google Analytics, E-Commerce Tracking, and Conversion Tracking) but also go over how to setup Goals and Funnels with a specific emphasis on Zen Cart. It provides easy-to-follow screenshots, and detailed step-by-step instructions, in addition to valuable information that helps you use what the reports tell you to increase conversion. You’ll learn how a few key statistics (provided to you by Google Analytics) can make or break you when it comes to increasing sales. If you don’t know what these are, you really need to do yourself a favor and find out by reading this workbook. You could be losing sales if you’re not tracking the right data and reading it properly. Complete with hands on exercises and a self quiz, this workbook helps you understand how properly using Google Analytics and all its components can increase the performance of your web site. I have bought a copy of this workbook and I finds it very useful for everyone who wants to set up google analytics step by step and quickly. I am using GA with my zencart e-shop for several week with e-commerce and goals tracking. Are there something like case studies or “patterns” – what does certain combinations of variables means, what are recommended values that can indicate that our shop is well optimized and what changes in e-shop can lead to reach that recommended values? Something like surefire ways in GA?:-) . There are a number of metrics that you can look at (a few of the important ones mentioned in the GA Workbook) but currently I have not developed a “surefire ways” google version. I am working on the completion of a membership site that helps store owners follow the same paths I use to create successful ecommerce businesses. That should be ready in the very near future. It will help store owners keep track of the various elements that are needed in order to run a successful site. That is something you may be interested in as well. This sounds like it could be beneficial to me, I may purchase the workbook. These spaces were put in by the system in order to get it to post to the comment section here. 4) Remove (or rename) the “checkout_success” directory under your template directory (not the core one) and you’re all set. You don’t need the “tpl_footer.php” that JAM made you alter and which is found here. If this directory is in place still the JAM code will override the GA code on the checkout success page and you will find that JAM works, but Google Analytics does not. But where does the JAM AFFILIATE portion say “yourdomainhere.com”?? I knew it should have said that (I’ve done it a hundred times) but didn’t see it in my comment post after you mentioned this. I corrected the issue by adding a few spaces to the comment. It turned out that the system here prevented portions of the original code from showing for security reasons. Hi Eric, you referred me to this post from the ZenCart forums and I just wanted to say thank you…worked a treat! Glad it helped you out Adele! I see some of the comment of this book is from 2008,just want to know if this book is up to date that still fit today’s situation? Many of the areas in the book still fit. Google has updated the look of their interface since then, but the locations and concept remain the same.